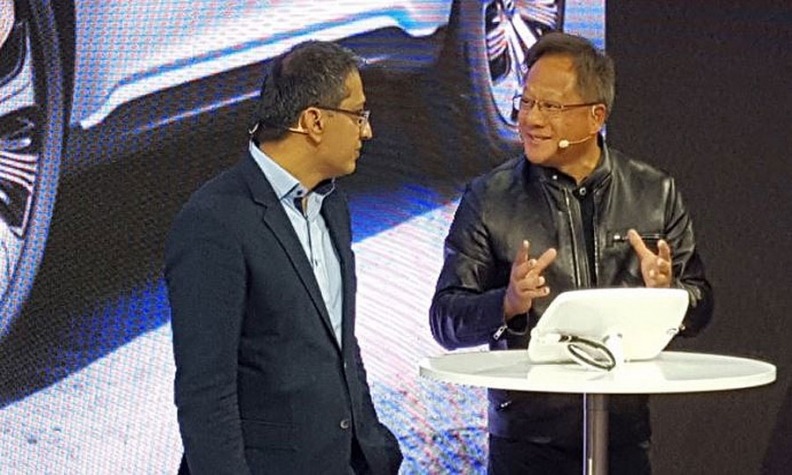 Sajjad Khan, Mercedes-Benz vice president of digital vehicle and mobility, left, and Nvidia CEO Jen-Hsun Huang discuss their collaboration at Friday's CES event. LAS VEGAS -- Mercedes-Benz plans to introduce a production car powered by artificial intelligence in the next year as part of a collaboration with chipmaker Nvidia. Plans for the car were disclosed during a talk Friday between Sajjad Khan, Mercedes-Benz' vice president of digital vehicle and mobility, and Nvidia CEO Jen-Hsun Huang, at CES here. "I am very proud of saying that within 12 months we are rolling out a product with Nvidia," Khan said on Friday. Very few details of the car are known, including whether it will be a completely new vehicle or an existing Mercedes model. It is a product of a three-year collaboration, according to Huang. Teams from both companies are embedded at each others' headquarters in Sunnyvale, California, and Stuttgart. It's also unclear how artificial intelligence will be used in the production vehicle. Earlier at CES, Nvidia announced multiple partnerships with carmakers and suppliers such as Audi, mapping company Here, and auto suppliers ZF and Robert Bosch. Nvidia also revealed an AI-powered safety system called Co-Pilot, according to TechCrunch, which uses voice recognition, facial recognition, and eye-tracking software to assist drivers. AI, and the related concept of 'deep learning,' is viewed by industry players as key to adapting self-driving cars for a multitude of driving scenarios. Deep learning involves, in its simplest form, flashing a car's "brain" with millions of related images so that the system can learn to recognize key features. This way, a self-driving system can evolve as it logs more miles and encounters varied situations. Nvidia has a number of automotive partners in this arena, including Volvo, Audi, Honda, and BMW.